It is a no brainer that Corruption In India is at its rampant best.There is not one section of the society that is spared from it.Corruption in the form of bribery takes the cake and given that it begins at the grass root level makes it even more difficult to monitor and control.TheÂ Corruption and Bribery Report published at trak.in earlier , gives a detailed breakdown of the scale of the bribes and the reasons why bribes are given. The striking though well known findings of the report points out that close to half the bribes are requested by the Government Officials both at the state and national level.The same government personnel who are entrusted with the development of the nation are filling their own pockets.No wonder then the nation’s politicians are the most corrupt lot. However, it it was only for the petty money minded officials filling their own pockets, the enormity of the bribery might be restricted to a certain level.What if corruption takes the shape of a billion dollar behemoth.According to Management Guru C.K.Prahalad , the cost of corruption to the country might as well exceed Rs. 250,000 crores. The total spending for the 2009 Lok Sabha elections is pegged at a whopping Rs. 10,000 crore.The breakup of this spending throws up some interesting insights too. 8000 crore spent by political parties and individual candidates ? Where do they get hold of this kind of money to spend. Again, it comes as a no brainer that it is hugely attributed to the Private Funding that political parties attract from big pocket industrialists.The reasons why private spending of this scale happens again is rather simple Favourtism.It is a well known fact that government support is crucial for industries small and large.One favourable swing in a huge tender or a favourable policy, and all the benefits can be reaped. Given the risky nature of the investments in elections, politicians as venture capitalists, we can assume, will not settle for less than a 10-fold return. More than spending by individuals and political parties, what i fail to understand is , Why is a 10,000 crore rupee spend needed for carrying out Elections.There can be infrastructure and operational costs, but they can never amount to such alarming numbers. Now, when the government is well aware of crores of amount spent on election campaigns and product like advertisements with politicians selling themselves door to door, why cant regulations be implemented to stop all this waste of money.Why cant the regulatory bodies impose a maximum cap on the amount spent on election campaigns failing which the political party is banned to contest.However, accountability is something that leaves a lot for asking and barring which none of the measures to put a stop to corruption can reap rewards. It is embarrassing that billions of dollars are being spent on electing leaders who do nothing more than succumbing to taking bribes after getting elected. The gory facts are for everyone to see but then a solution as usual is not in sight. Can you think of a possible solution to this massive problem? Do share your thoughts. The source of income of political parties and the nexus between them may be more revealed. If this billion dollar industry is crushed somehow or the other, corruption mitigation could become the biggest growth engine of Indian economy. An article on 'indiarealtime', a subsidiary blog operated by the Wall Street Journal asserted in July 2010 that the incumbent Indian Prime Minister Dr Manmohan Singh was earning an annual salary of approximately $4,106. In the same article it states that Dr Singh's "various cash allowances total approximately 50,000 rupees" per month, which would equate to approximately $12,000 per annum in total, but that a raise was in the offing. The Prime Minister's Office website breaks down Dr Singh's earnings in a downloadable pdf which is dated 31st October 2010 and it can safely be presumed this is still the salary and allowances of the Prime Minister as it stands per month. 135,000 INR (Indian Rupees) per month? Sounds a lot – is it? It converts to roughly $3000 a month, which in comparison to the previously stated salary reported by 'indiarealtime' is a huge 200% raise, however the aforementioned article points out the fact that in relation to other developing nations it seems a very modest wage indeed. How does it compare to the wage of the average tax payer? If you consider that the average annual wage in India equates to around $6000 then it is six times the wage of the average taxpayer and does start to look a little extravagant in comparison, but when you consider other world leaders such as The President of the United States of America earns $400k per annum, while the average US citizen earns $46k a year (10x less than the leader of their country) then it begins to sound a little more reasonable. Are Indians happy to foot this relatively meteoric wage rise? Well as we can see, Dr Singh was earning a very low wage in comparison to his peers so it would be fair to say that some people in India wouldn't begrudge him earning a slightly better salary than he was on. Whether they would have welcomed such a huge increase is contentious, especially considering that inflation has seen the price of food in India rise 16% since 2010.
when king(One day Beggar) is/are Businessmen then people have to live like a beggar for ever..live like a life style of Mahatma Gandhiji. (Physically).then only common man can spend their life in Republic India! Just I am jocking! "Satya mev Jayte" is a a funny sentence! its a fact in jock status..Be Bold othe vice we have to be Bold to fight against Corrupted life style or to be ready to live like a slave in our Independent(!) Nation. jeena yaha marna yaha iska siwa jana kaha. Lot say about corruption. Some say if the Young generation comes into power, corruption will be stopped. Surprisingly, corruption starts only with the new generation and with the young generation only. Many Live examples in Government Offices where in most of the new employees who are recruited in place of Compassionate Grounds of their parents jobs have lot of aspirations like buying a luxurious items for their homes like Car, A well Furnished House or Flat in Posh Area or Plot in a Posh Area or buying branded products or Mobile phones with GOLDEN ornaments in a short span. To full fill these aspirations in no time, they opt for CORRUPTION wherein these young generation members speak lot about corruption. But when it comes to their turn, they make a turn and make others surprising that CORRUPTION is their Birth right. Isn’t true? Every true Indian is desperate and seeks a fool-proof and quick remedy to the social evil which has grown over many decades after Independence. Many feel helpless but a few who want some action do not think clearly. It is generally agreed that growing economic devide among the population acts against any good intentions and measures to weed out corruption. The primary, though long term action must aim at levelling the economic inequality. Coupled with gradual education of the masses towards surviving the ever changing economy and good health support will go to help realise the aim. Often, desperate Indians cite Hong Kong as an example to follow in weeding corruption. There are finite differences though, to India and Hon Kong. One is the size and make up of its population; India is really a collection of cultures, religions which is akin to Europe. The EU today is a fair example of how difficult it is to achieve an end result even if member states agree in principle. Besides, Hong Kong had a restricted democracy and is under the umbrella of China. Which brought the positive climate of autocracy to implement the framed rules for eradicating corruption. Plus, Hong Kong was/is still an economically healthy state. The Indian solution needs reforms in Parliamentary, judiciary and administrative domains. It is easier to carry them out in administrative part of the solution. It needs a lot of peoples efforts, rigor and moral commitment to reform the other two. It will need a large time scale over which constant efforts to monitor and apply corrections mid-course is required not to mention the legislative and administrative support. So, Hong Kong is a success story; not necessarily the paradigm for India to emulate. Very well written comment and I second your opinion completely !! We need antibiotics to cure the corruption bacteria!!! It looks like 80% of the Indian’s want corruption free India. Unfortunately, we accepted corruption as part of our life. Now, it became widespread bacteria in our society. These bacteria became powerful in the country. It is ruling us. 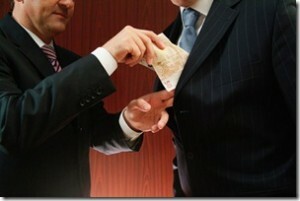 How do we get rid of the infectious decease called corruption? In needs to be cultural change in our society. There are lots of great people join the IAS and IPS cadre with great mindset to serve the country. But, unfortunately the surrounding force makes them corrupt over the time. These are young bureaucrats can be used as antibiotics to cure our country. We need to identify the young IAS and IPS who are determined to serve our country and build a base for them where they can become good politician. Once we identify bureaucrats who are courage and vision to serve our country, we need a build a big fan club surrounding to that bureaucrat. It is similar to any actor or actress having a fan club. We need to political stage for them by promoting their image within the particular district or city. Our object should be making them Member of Parliament after they serve as a bureaucrat for at least 5 to 10 years. Our Indian Parliament has 802 MPs; we need start replacing the corrupt bacteria MPs with the young vibrant and visionary young bureaucrat antibiotics. We can see major change in our society within 5 to 10 years. I guess Vishal wrote his opinion in January 2010 and by January 2011 the whole landscape has changed. A series of scams like CWG Scam, IPL Scam, 2G Scam, Adarsh Scam has rocked the nation in a short span of time. The effect is so bad that now India seems to be the most corrupt country in the world and to top it all, the CBI which normally reports to the PMO is being overseen by the supreme court for its investigation in 2G scam which involves the government as well. The government should be ashamed as most of the recent corruptions like CWG Scam, Adarsh and 2G are related to either politicians or ministers close to the PM. Corruption will never end as long as the entire system is under the control of Politicians; these guys enjoy unlimited power today. They can influence anything, Judiciary, Police and other services of Government. In fact all of these are a nexus. Ample cases have been reported wherein politicians were involved in corruption, why they are not behind the bars. Raja and others in Spectrum Scam, Kalmadi in Commonwealth games scam, Mayawati abusing the system by spending 2000 crores on her statues. Why are they not behind the bars? If the news is correct then they need to be arrested, if it’s not then new channels and news papers which report such things need to sued. Everybody knows the former part is true. But media too has vested interested these days. They know their medium can be used effectively to make quick bucks. Unless the people who are accountable for such things are not convicted, nothing is going to change. But who will do that. Police and Judiciary are controlled by politicians. Everyday news appears on channels and newspapers about these guys involved in Scams, extortions, murders, rapes with enough evidences but they don’t even get questioned. Even if they are arrested for names sake they get VVIP treatment. Why such a differentiation, criminals are criminals, doesn’t matter who they are or who they were. In fact if dignitaries are involved, the punishment needs to be ever more severe. We have bails to get out of every other damn offence. Wonder how the rule book looks like. Punishments are only for the feeble, you don’t have money or power support be ready to count the bars if you are in the hands of law. Every other living thing in India knows that politicians each day are taking this nation to a new low. India has enough money which if spent properly this nation could achieve anything. This system of politicians deciding the fate of this country has to change. Laws need to be amended; severe punishments need to put in place. But the people who should be making these laws are the ones who are breaking these laws, so there’s no solution?. How corporate recruit employees from best institutions, politicians come from the best jails in India. We don’t elect these guys, they get elected. Even if nobody votes for them, one of them will get elected, that’s the state of this country. Join the movement “India Against Corruption”. Visit our web site http://www.indiaagainstcorruption.org. Tell all your friends and relatives. 2) The law breakers are the law makers. So they will not bite the hand that feeds them! Elections are indispensable in any democratic set up. We need more transparency in processes inlcuding entire financial transactions from/to/with in country. Time up for a change in currency system !!! If we stop printing currency and move to digital currency, the piled up billions worth black & fake currency can be wiped off and an economical cleansing is possible. What do you think? Recently I had gone to get a new license at suburbs in Mumbai. I was charged 40 Rs fee and handed a receipt of 24.60 Rs. When asked for why I was given receipt for only 24.60 Rs, I was told the breakup as 24.60 Rs which I believe is the actual charge. Additional 5 Rs for the tech guys who take the pictures and update the database and 10 Rs as EXTRA. This shows how openly people are bribing in our country and we don’t even notice it or protest it. With about 500 people paying 10 Rs extra every day, its turnover of 1.5 Lakhs a month. With so many people involved in it, I wonder how much each individual even makes from it. I feel pity that people are willing to ask for bribe for even such a small amount. I would have happily paid 100 Rs as charge if it was official. If there is room for increasing the charge and government to make more money, firstly government is loosing on a opportunity to make more money. Secondly, people are already paying the same amount anyway. What can I do as a citizen here? I thought about reporting it to a news paper but then thought maybe I should first report it to local RTO head? But I have no doubts that he is already aware about it. Also, after disclosing this, I may not even get a license ever? Or ultimately would need to bribe a lot more than anyone else does to finally get it? Is there any official entity which maintains anonymity and where we can report such incidences? Even after googling where I could report this, I did not find any official entity to which you can report corruption? As some people have commented, refusing to pay bribe can only be part of the solution. But can you tell to the father who wants his son to get an MBBS or MBA seat by paying donation to the College? Can the admission be delayed by a few weeks/ months or years because the father will not pay the bribe? As the seats in the college fill up from other ‘willing’ students, the prices will go up and not down. We all can think of hundreds of situation where one does it out of necessity and not necessarily out of convenience or wanting to take short cuts. It could be to ‘smooth out’ the issue rather than anger the official/ or party concerned. I wonder what Management Guru C.K.Prahalad or Economist Amartya Sen would suggest as the possible solution to this problem. As a student who is pursuing his degree in BBA, I can suggest that we need to increase the number of government colleges where MBBS and MBA can be pursued by the students because this isnt available the students have to compete not at 90% but at 96.5%. The student who does his due diligence and does get a 85% is not asked about!!!! then the parents still getting their sons/daughters to do better get them admission through Bribing. 85 % seriously isn’t what i would expect to be a bad number for an excellent student. Also most of our education system focuses on numbers. Courses like Real estate, Politics, art history, agriculture development and urban planning are still not existing. everybody want their son/ daughter to do MBBS or MBA nothing else. More options and more colleges is the key to this problem. This completely my opinion and if you think of something else please share. Sahil – Agree with you about supply pressure. I was just giving one example where bribing was out of need and not just taking a short cut to a goal or curry favours. If we stay on the education example, if the student has got 40-45% results and wants an MBA, I don’t have a view whether the parents should make donations or not, but the very fact that the college admission is controlled by people and there is a lack of transparency leads to management or some people taking advantage of it. If there is an automated processes for college admission then if the student has secured not x% but is in top 5000 in the eligible candidates and he has choices 1,2,3 for the course (MBA, MCom, etc) and he also has choices of a,b,c,d for college names (IITB, BITS Pilani,…) then an automatching system, based on the results of the student, could assign the college and course and there would not be for human intervention and hence bribing. If the student has change of heart about what he wants to study or choice of college there can be another process to care of it, or pass the seat to the next eligible candidate. I hope that what Educomp, IGNOU etc are trying to increase schools and colleges, and also online learning solutions, should address some part of the education problem. However, with respect to the overall subject of corruption there needs to be more comprehensive solution depending on the industry, process etc. I want to ask is there a solution for a situation like this??? how do we implement it. What do i do??? just not think of it. The people have adjusted to it because thats what we do. I would be lying if i say i wont use the agent the next time because it is just more easier to do so. how do you tackle that ?? Sahil, the problem you faced is exactly what is causing all the problem.We have been forced to accept that bribing is the norm to get work done. Not only I appreciate the whole you choosing the right way but i commend you for it. The problem here is not That we choose to bribe or not. You took 3 months of your time for a procedure which is legally supposed to take you 1 day. This isn’t impossible as the agent is miraculously able to do it. So what do we do???? We make the Agents part of the system!!!! hell we take out a Tatkal Scheme such as in passports Where you can get your driving license renewed in 1 day for Rs 500. Employ the agent and give him a salary, I dont care. At least the government would not have to loose on that more, it is already lost. The procedure finances itself. Also please getting rid of the person who is sitting at the counter not doing his/ her job with probably a blacklist certificate for not being able to get hired in by government organizations also a huge fine. !!!! Absolutely Ankit. Recent killing of the RTI activist Satish Shetty in pune (http://beta.thehindu.com/news/article80222.ece) is a strong signal that the corrupt and powerful are calling the shots in this country. I believe the solution should be grass root level. It cannot be top down cleansing which is what we all have false hope of. Great revolutions have started from the common people. Education and awareness of the people can bring about the change. By people I count all the 1.2 billion Indian living across the country. Maybe some of it is for us to blame too. We always never ask questions, never put our concerns in and this is even when we do it. The example being fine for traffic violations Rs 500 for speeding or 50 for the officer? That is a no brainer !!!!! How about we stop spending on the elections pay our public servants a decent salary and then see the effect???? Also getting a Public servant job is not as easy as we think after you pass the exams on merit we still have to bribe and claw our way to get that job hence it is obvious the person who got the job is going to recover that investment back. A simple solution could be government programs saying all the elections stuff information cold be shown be a Media Channel (Doordarshan ) which would include atleast the debates and the ideology the goverment or the party is following. Agrfee with u Sahil!! As i mentioned before, we are equally responsible for the situation.At smaller levels, we tend to get away by bribing. Infact, Arun has a recent incident where he chose to pay the fine legally and did not resort to bribe !! May be that is the kind of citizenship that required . The worst repercussion of corruption is that it negates meritocracy altogether. High recognition and encouragement of merits is the cornerstone for the progress of any society. It’s sad we have created a breeding ground which is taking our country ever further down. Second that completely Vikrant!!! Corruption causes more then the monetary losses.As mentioned in the post, Favourtism is an evil.Kills merit like nothing else does.More so, killing meritocracy at those levels of national/state importance means that the nation’s growth stalls too!! The cause of India’s corruption is due to our previous socialist type of economy, but from the time of economic liberalization there has been a steady decline in corruption. So as you see the extensive regulation forced people into giving bribes which spoilt the entire system, so to reduce corruption we’ll need to implement more liberalization strategies. Kerala is the least corrupt state because it gives its citizens absolute power and freedom, not only now but from the time of independence. The small bribes taken by police officers and small officials isn’t a big issue, its impossible to stop that and its of no use even if we do, all we have to stop now is the high level corruption. Now, I don’t see anything wrong in the high spending during elections Arun, this cannot be called as money which comes from bribes, most politicians use donations from the public and small businessmen. Currently we’re having a stable, able and honest government in the center, so we can just watch the change coming. Apologies for the mistake, it isn’t Arun its Ankit.